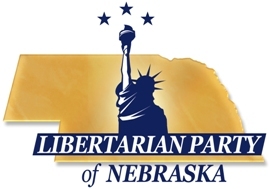 Contribute to the Libertarian Party of Nebraska! Help us achieve our 2020 Vision for the Libertarian Party of Nebraska! We have a goal of 50 candidates statewide for 2020, and to do that, we need a war chest to battle against the old parties. Here is your opportunity to donate monthly to the only party in Nebraska fighting for your civil and fiscal liberties. By checking this box I acknowledge that contributions from corporations and foreign nationals are prohibited (Permanent legal residents of the U.S., i.e., "green card" holders, are not considered foreign nationals). I also acknowledge that this contribution is made on a personal credit or debit card for which I have the legal obligation to pay, and is made neither on a corporate or business entity card nor on the card of another. Further, to validate my membership, I certify that I oppose the initiation of force to achieve political or social goals. Federal law requires us to report the name, address, occupation and employer for each individual whose contributions aggregate in excess of $200 in a calendar year.